Welcome to Socials 10 with Mr. Fitton! As we wave goodbye to Mr. Grant and thank him for his excellent Units on Geography, Early Canadian Pioneer History and Confederation, we are looking forward to learning about Louis Riel, the Metis People, The Emergence of Vancouver and the Gold Rush! 1. Mr. Fitton will display the rules for the Semester. The slideshow below details my expectations as a class. Now, a couple of videos to help us understand Mr. Fitton's new Rules. 2. "I forgot my phone" encapsulates what we miss when we spend time on our phones. Class is for learning collaboratively and with teacher assistance, phones as a tool are awesome, but as a toy, they become a distraction. As a class, we will have a discussion on phone use. 3. "Marshmallow Test." At the heart of this funny video is the concept of "Delayed Gratification" which means that by delaying doing what is fun or feels good in order to do what is important, we teach ourselves to be more successful and to hold off for the big reward (Job, career, relationships, etc.). Why would Mr. Fitton show this video to class. What is his point? -Class discussion where we make the rules how they do in Nunavut. A consensus style government. What do we value, what do we wish to see in class? -Mr. Fitton will handout a student form asking to know a bit more about you so that I can best meet the needs of the class! The Nunavut, Consensus style legislature. 4. Activity: Importance of working together. Mr. Fitton will make a design on the floor using tape. Within the box, there will be smaller boxes. Students need to see how many they can fit within the smallest box. Using teamwork. Mr. Fitton will then ask the class to link the activity with greater ideas about life and this particular class. 1. Intro: The Story of Louis Riel is story of a rebel, a story of good vs evil, a story of a small group of freedom fighters, fighting "The Man." -We will frame our discussion of Riel and of the Metis as the story that inspired Star Wars (ok, a bit of artistic license taken here). 2. Text Sets. We will as a class, introduce the unit by taking a look at four pictures to help us scaffold what the unit is about. A. One student will face the LCD screen, and the other student will face the back of the class. However, both will sit next to each other so that they can easily explain to the other what they see. B. The student will have 1 minute to explain the photo in detail . C. Both students will then look at the photo. The student who was listening will have to offer the student who was explaining, a compliment. 3. Class discussion. If you only had those four pictures, what would you think that this entire unit was about? 4. Mr. Fitton will then provide each student with 5 pictures from throughout the unit. Next to them is a blank space. Students will write in one sentence what they think is going on. Then they have to put the pictures in the order that they think they will be. As the unit progresses, we will see who is correct. Who got the correct order. Students need to keep this sheet close at hand. 5. Mr. Fitton will discuss briefly the differences between the NWC and the HBC - See page 128 (and 126, 127 if you are keen). 6. Read introduction to the unit on Page 138. "The Metis" and "Children of the Fur Trade"
7. Introductory Activity. Musical Chairs or Desk Hop. -Get students to make a name tag for their chair that indicates that it is theirs. Get them to name the chair. -Discuss of where they sit and what does that mean about them. -Why do some students sit at front/back of class. -How would they feel if someone else sat in their spot. What response do they have? -What if person insisted it was actually their spot? -Play musical chairs with their chairs. Mr. Fitton will be unfair and take away multiple chairs. Let some people back in. Give some immunity, etc. 8. Class discussion: Relate to the Metis Unit – they have land that is arbitrarily taken away from them. How would they feel living a game of musical chairs? Who was the bad guy? - It was Mr. Fitton - yet they got mad at each other. 9. Scavenger Hunt. Distribute the textbook Scavenger hunt sheet. Have students go through “Pioneer Settlement” which is one of the big old books about Canadian History. Work on it in pairs. 10. Students can work on Chapter questions package that had the timeline on it that they took notes on. 1. 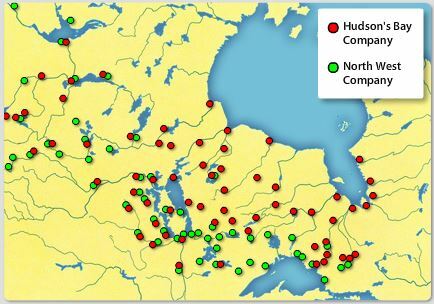 Notes on the HBC – have students take notes on the Hudson’s Bay Company. 2. Overheads showing both territories of HBC and NWC. -Ask kids what they think each shows about each company; Stay by the Bay Policy - Fur traders come to them. 3. Read 132 and 134 In Horizons as a class. – Only passages highlighted by teacher. 4. Metis games often involve dexterity and quick thinking (all have to do with their life/environment). We will simulate this by playing the "Link Tag" game or play the chair game (where chairs have empty spot, have to get out of chair and into a new one without the person behind you tagging you) – ask students what makes a person successful at this type of game… Why would I use these to simulate a "Metis Game." 5. Chapter Questions work time. Must be done up to NUMBER 11 for tomorrows class. -One thing they remember from last class. Can open up chapter questions, or scavenger hunt on the HBC and NWC. -Review where we are so far on the timeline. Go over timeline again. -See also the video of the lecture on the left. -Most of the material will be also covered in a film. 3. Metis video. Play the following link as a class. -Fast forward into the section on the Red River cart --- just to show the sounds it made. 5. As a class, go over answers to Chapter Questions up to number 11. They help set the story for our next little activity. 6. Miles Macdonell Pemmican proclamation activity. = to review the Pemmican Proclamation. -Students must act out what happened. Cut class into squares. Students are allowed to trade freely at stations around the room. Then Miles Macdonell bans them from trading outside of the Settlement. Lose money. Stop and get them to explain their emotions. 7. Read out page 145 - Pemmican Proclamation. -Finish second set and we will go over them as a class tomorrow. Each student will receive a question in groups of two and will have to answer it on the board for the entire class. Finish up. 9. Mr. Fitton will bring in Pemmican for students to try out. 1. Reminders/Announcements -Quiz tomorrow on information learned so far. 3. Go over answers to Questions Completed yesterday. Check on students to make sure they finished them at night. 4. Lecture on George Simpson. – Read as a class – in a circle. Page 149; 153. 6. Write the meanest thing you can about someone – activity. We will gain historical empathy with George Simpson – students are to write in 50 words maximum, the best insult they can about someone. Cannot be someone in class; must be a celebrity. "Celebrity Roast.." Much like the recent Justin Bieber Roast. Keep it appropriate. OR we can do a "compliment roast" SEE VIDEO TO THE SIDE. Mr. Fittons: As appealing as a ball of phlegm, his laugh grates the ears like a kitten being shredded by a band saw; he’s also so dumb that I would have a battle of wits with him, but I refuse to fight an unarmed man. -Go over timeline so far --- get class to draw a line with pencil in the area that they have already done. 8. Ask Students if they have any questions. -Get students to fill out the video quiz sheet --- on the back is “the bison hunt.” We will do that activity tomorrow. Bison Hunt is for marks, so please do not lose the handout. 10. As a class, we read 2 passages describing Riel.. and see if they can guess who the person is.. then explain is it the same person. 12. Watch the following two videos as a "hook" intro to next day's Bison Hunt video. George Simpson, Fort Garry, Cuthbert Grant…. 2. Video: Episode 9 “A Single Act of Severity” – 24:41 - 33:12. Explain significance of the act – up until this point, Riel could have negotiated with Canada and formed a province, but the murder of Thomas Scott changes all of this. – fill out green sheet that has video questions on it. Go over these. 4. Lecture on Metis – with fill in blank “Good/Bad/Ugly” sheet --- Draw timeline on board. See timeline in the document below. Answer key is attached to the second page of this document. There is a photocopied rear page as well. E. HBC giver Rupert’s Land to Canada. 5. Game - let's play "Hotseat" 1-4 students come up and are major characters from the history we are studying. The class asks them probing questions and they must respond as though they are the characters. 6. Read questions on the back of the “Good/bad/ugly” sheet. Have students read through all of the information in order to find the answers. May have to answer in margins. 7. Go over importance of Buffalo and picture below about the uses of the buffalo. 8. Introduce the Buffalo hunt assignment. -Clearly go over the criteria. Go over example. Students should write incredibly detailed responses. 10. Do the Buffalo simulation exercise – students sit on desk with a dart gun and other students shake the desk as they shoot the dart gun at the chalk board with a pic of a buffalo on it. See how hard it is to ride and shoot. -Put on some cowboy music. 11. Students work on Buffalo Hunt Assignment - see below. 3. Review “Good, Bad, Ugly” – what did we learn yesterday. 5. Students must answer questions from “Good, Bad, Ugly” sheet on the back of it. Can also work on Buffalo hunt if they were away yesterday. 6. ASR: Hand out Unit ASR for students to complete. Will play “Bingo” tomorrow. 7. Read the Louis Riel Comic book from Chesterton? 9. See below for examples of students from the past who completed the Parody Assignment as a video. Read Page 130 of the textbook - Details how the fur traders and First Nations travelled by boat. 3. We will also watch a video on Productivity - to help us study and to help us work hard on our assignment.